You’ll love these vegan and healthy Lentil & Walnut Tacos that are perfect for a Meatless Monday dinner. To me, this dish embodies flexible, high raw cuisine at its finest. 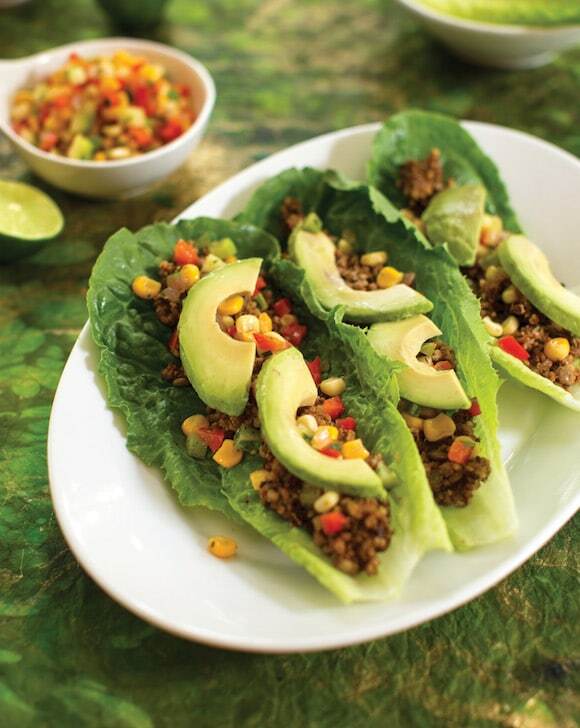 Using romaine leaves as a “taco” and walnut as part of the taco “meat” are standard raw foodie tricks, but the addition of cooked lentils adds extra protein, iron, and healthy complex carbs. This is a stress-free meal, easy to whip up at a moment’s notice if you have some lentils in the freezer, and you can top it however you like! Add the tomatoes, spices, and lentils to the processor. Tablespoons of salsa and a few avocado slices. Serve. And, I’m also sending one lucky winner a copy of the book. The winner as randomly selected from over 300 entries is…Candy R.! I hope your summer is going well, can you believe that tomorrow is August 1st? Until next time, happy summering! Want more inspiration for healthy, balanced living? Follow me on my social media accounts @carrieonliving: Facebook, Instagram, Pinterest, and Twitter. The kitchen looks great! 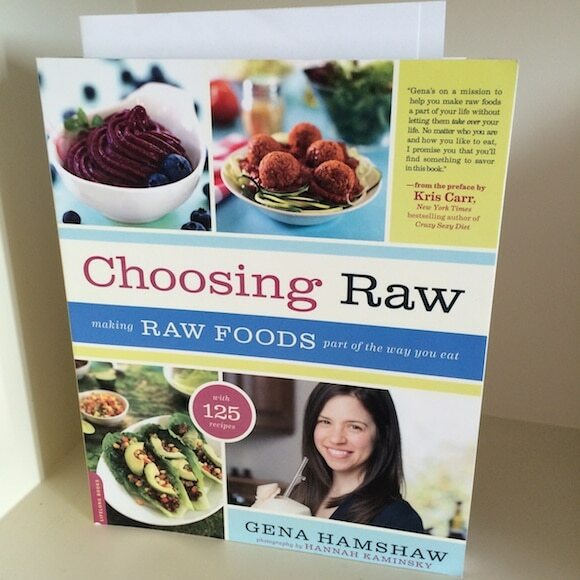 I love raw tacos- can’t wait to try this one! Gena’s recipes are always so delicious! I agree, Alex! P.S. 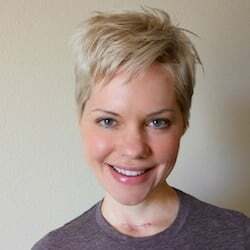 I saw you at the Healthy Living Mini-Con on Saturday, sorry we didn’t get to chat! I hope you had fun at the conference. Xo. I know! So sorry we didn’t have a chance. I had to leave early to head back for an event in Sacramento that evening. Great panel! I plan on heading to the Food one in Portland next year so hopefully we can connect then! Thanks, Alex! I didn’t realize that BlogHer Food would be in Portland next year…I’m in!!! ohgoodgolly just two minutes ago I was looking at the giant jar of lentils in my pantry and wondering what to do with them! Thanks so much for sharing the recipe! I’m not vegan, but this looks great. My boyf is a carb lover so sometimes we do one wheat wrap, one lettuce wrap just to ease him into it! I think this filling would be awesome either way. 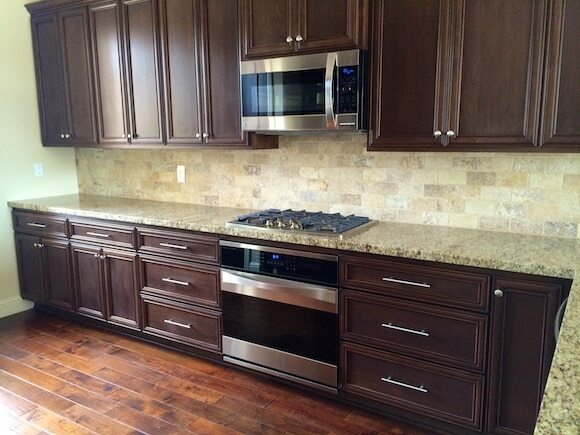 best of luck with the move, your new kitchen looks lovely and sooo spacious! Thanks for the support on my move…I haven’t packed one thing from my kitchen yet because I keep thinking “oh, I am going to need that soon.” ACK! Mmmm this looks so good! I can’t wait to try it out. It will probably be my lunches next week. Yum! Ohhhh, the tacos would make a great lunch for moving/unpacking. Hope your transition goes smoothly! 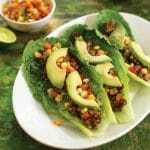 I love using lettuce as taco wraps! Also, I’m very jealous of your new kitchen! I wish I had all that space in my tiny apartment! Perfect combination of a nice kitchen and great recipe!